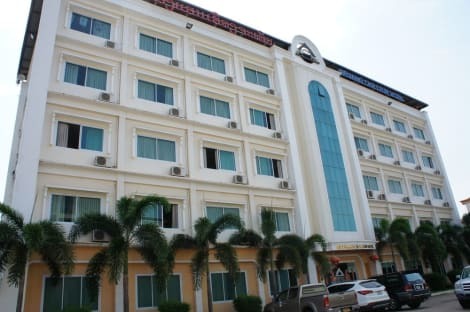 Situated just a short drive from Vientiane city centre, Douangchan Plaza Hotel welcomes guests with comfortable air-conditioned rooms and an on-site restaurant. Complimentary WiFi is available in all areas. Rooms are simply furnished and decorated with tints of red and gold. Each room here will provide you with a flat-screen satellite TV, a balcony, a fridge and a seating area. Featuring a shower, private bathroom also comes with free toiletries. Douangchan Plaza Hotel has a 24-hour front desk with helpful staff that can provide travel information as well as restaurant and sightseeing recommendations. There is also a small internet corner with a computer for guests to use at the lobby. The hotel is less than 1 km away from the famous Vientianne landmark, the Patouxay Monument. Other culturally significant places including Laos National Museum, Wat Sisaket and Hor Phra Keo are approximately 2 km away. Government offices and embassies can be found within a 10-minute drive. Wattay International Airport is 6 km away of which shuttles can be arranged for an additional charge. Make yourself at home in one of the 73 air-conditioned rooms featuring refrigerators and minibars. Complimentary wireless Internet access keeps you connected, and cable programming is available for your entertainment. Private bathrooms with showers feature complimentary toiletries and slippers. Conveniences include phones, as well as desks and complimentary bottled water. Enjoy a meal at the restaurant or snacks in the hotel's coffee shop/café. Relax with a refreshing drink from the poolside bar or one of the 2 bars/lounges. Buffet breakfasts are available daily from 6:30 AM to 9:30 AM for a fee. At Vientiane Hemera Hotel, enjoy a satisfying meal at the restaurant. A complimentary buffet breakfast is served daily from 7 AM to 10 AM. Make yourself at home in one of the 19 air-conditioned rooms featuring refrigerators and flat-screen televisions. Complimentary wireless Internet access keeps you connected, and cable programming is available for your entertainment. Private bathrooms with showers feature rainfall showerheads and complimentary toiletries. Conveniences include phones, as well as laptop-compatible safes and desks. Located in Vientiane, S Park Design Hotel is a 3-minute drive from Chao Fa Ngum Statue and 7 minutes from Haw Phra Kaew. 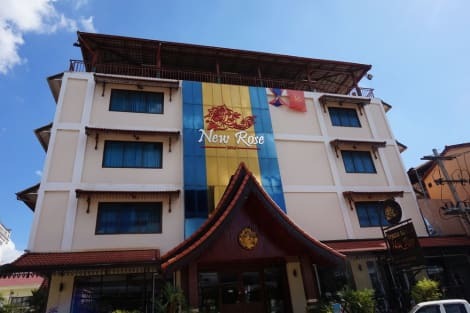 This 4-star hotel is 16.4 mi (26.4 km) from Thai-Laos Friendship Bridge and 17.7 mi (28.5 km) from Sadet Market. Make yourself at home in one of the 48 air-conditioned rooms featuring minibars and LCD televisions. Rooms have private balconies or patios. Complimentary wireless Internet access keeps you connected, and cable programming is available for your entertainment. Private bathrooms with showers feature rainfall showerheads and complimentary toiletries. At Xaysomboun Boutique Hotel, enjoy a satisfying meal at the restaurant. A complimentary cooked-to-order breakfast is included. At Riverside Palace Hotel, enjoy a satisfying meal at the restaurant. For your convenience, a complimentary breakfast is served daily from 7:30 AM to 10 AM. Somerset Vientiane is a serviced apartment strategically located between Rue Samsenthai and Rue Setthathilah, just a few minutes from the iconic King Fa Ngum statue. It is just a short 5-minute drive from both the business district in Chanthabouli and Wattay International Airport. Ideal for both executive and leisure travelers, the aparthotel offers a selection of studios to spacious two-bedroom apartments. Room benefits include free airport transfers and complimentary WiFi in each unit. Somerset Vientiane has both business and recreational facilities including a tennis court, a lap pool, fitness room, sauna facilities as well as a children’s playground. Services that can be arranged include laundry and dry cleaning, daily housekeeping as well as doctor-on-call services. The staff at the reception desk is also available on-call 24 hours every day to ensure a stress-free stay at the aparthotel. Somerset has a residents’ lounge and outdoor seating area that serves a daily continental breakfast from 06:30 – 10:30 hrs. Offering the conveniences of a hotel and the comforts of a home, each apartment is fitted with stylish furnishings, contemporary décor and modern facilities. It comes with a fully equipped kitchen, a separate living and dining area, a modern entertainment system and a designated work space. The private bathroom includes a hot and cold shower. 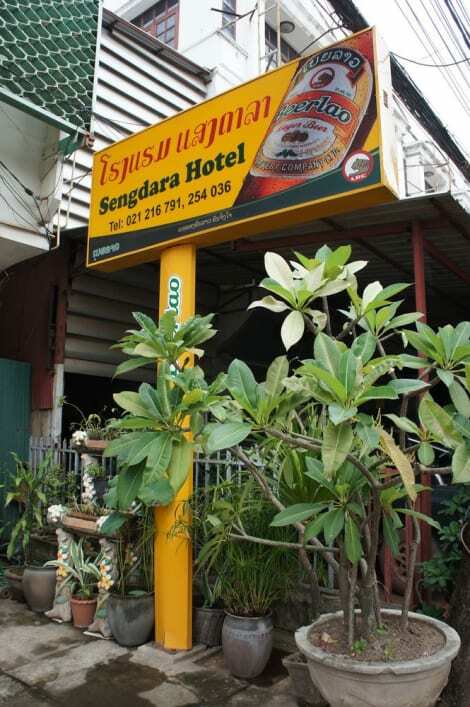 The apartment is located within a 10-minute drive of the famous Wat Sisaket, Night Market and That Dam Stupa. Talat Sao Shopping Mall and the Patuxay Monument are 2.5 km away. lastminute.com has a fantastic range of hotels in Vientiane, with everything from cheap hotels to luxurious five star accommodation available. We like to live up to our last minute name so remember you can book any one of our excellent Vientiane hotels up until midnight and stay the same night.